﻿Activity 1 is characteristic of an Absorb-type activity. The activity includes reading and presentations for the learner to build prior knowledge to the subject matter. Activity 2 is a Do-type activities of active exploration and practice. The Unwrapping Standards simulation activity offers learners self-checking practice. The Map It Out template offers learners the practical application of unwrapping their specific standard of choice. Activity 3 is a Do-type and Connect-type activity. 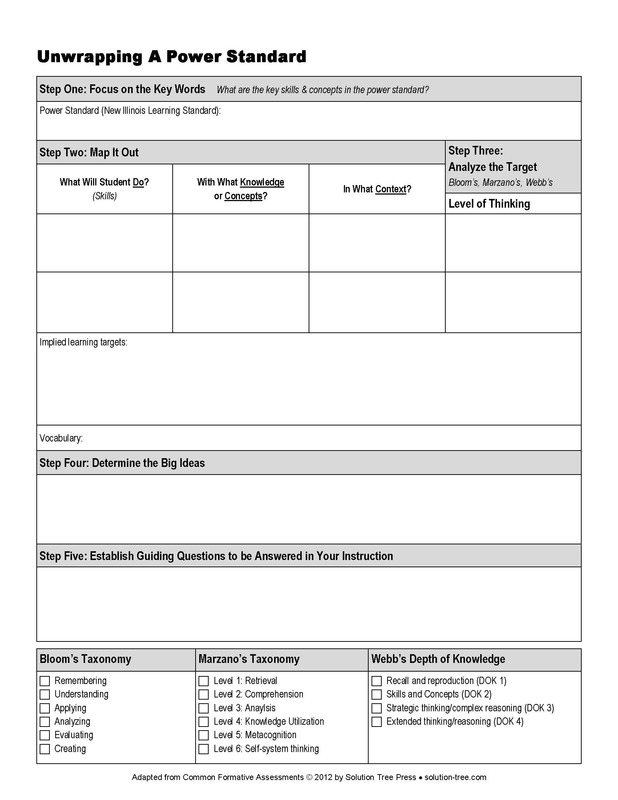 The Map It Out template offers learners the practical application of unwrapping their specific standard of choice while practicing the skill through collaborative review and sharing. Activity 4 is a connect-type activity. Learners are linking the information and skills they have acquired through the previous absorb and do activities to complete a job aid in which they will use to develop state standard aligned units and common formative assessments. This template will be refined and completed through subsequent modules. A formative assessment checklist has been developed to be used with the Unwrapping a Power Standard template and can be located within the Assessments menu within this website. The activities identified here are part of Module 3: Unwrapping a Power Standard. The [e] activity sheet below is a lesson overview developed to be provided to course participants. Network links would be modified based upon the school district technology structure.